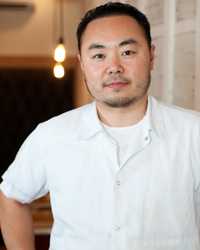 Why He's Amazing: Because he's cooking fantastic Korean food, gastropub style. Global Citizen: Born in Seoul, he moved to England when he was three, then to New York City at age 10. Change of Plans: Kim was three years into medical school when he decided to quit to pursue cooking professionally. "I wanted a career where I could help people, but I found out I actually wanted to please people... Most people leave [Danji] happy and that means a lot." Expansion: His second restaurant, a Korean joomak (a.k.a. tavern) called Hanjan, opened in December 2012.